My New Music Video, Chain Letter! UPDATE: 12/22/2013. This song has undergone an significant overhaul in the past few months. First, the immortal Feliziano B. Flores came by to help me flesh out the chorus and middle part. Mr. Flores was wonderfully inspiring, providing incredible work under time pressured conditions and my less than reliable producing. I thank him for that. Still, after working through some changes with the talented FBF, it still was missing something. At long last I found the missing piece and balance needed to send the song off on the glittering flying saucer I envisioned in my head when I first created it. As a result, I pulled the original YouTube video down and replaced it with the one below. I hope you enjoy it as I near the finish line of finally finishing my new album, Funeral Business! Originally published on September 7, 2012: I wrote this song by accident. I came home from Australia after five months of having no guitar to play with, and started to write a song about how miserable life could be. The opening line, “27 lonely years, you’ll be living with your fears, if you don’t send, this message to your friends,” was all I had. I had no idea what the song would be about, but I loved the rhyme scheme and the rapid fire delivery. As I kept writing lines that fit the pattern, it dawned on me that I was writing about the doom and gloom found in chain letters. After that revelation, it was only a matter of ripping off “Paperback Writer” and “Day Tripper,” and boom, I had a delirious new psychedelic pop song. My last music video, “Funeral Business,” featured the Ghostbusters rocking out to that jam, so I figured I’d return to the pop culture well for the equally spooky “Chain Letter.” One of my favorite shows ever, “Buffy the Vampire Slayer,” offered the perfect template for a song about tempting supernatural fate. I’d like to thank my friend Andrew Lee, first and foremost, for his incredible guitar solo. I’d also like to thank Lilja Nielsen for much needed video editing critiques, and the brilliant George Gross for more of the same. Lastly I’d like to thank my friends Matt Sturm, Sonia Rapaport, and Ian Wehrle for a bunch of moral support and musical advice. That’s enough yapping, so please enjoy the song and video below, and remember, chain letters only work when you share them with all your friends, so if you don’t wish to be cursed with 27 years of misfortune, please share this video with everyone you can! No, I’m not talking about the horrible Beatles cover band Broadway show thing, I’m talking about the 1966 B single of “Paperback Writer.” I’m posting “Rain” because I’ve met 4 people in the last two months that had NEVER heard of the song before, which to obsessed Beatle lunatics like myself, is just unfathomable. Perhaps it makes sense. “Rain” is rarely included on the best of Beatle compilations out there, and it was never on any of the main albums. Of course, it did show up on Past Masters Volume 2, the second part of their epic singles release record. 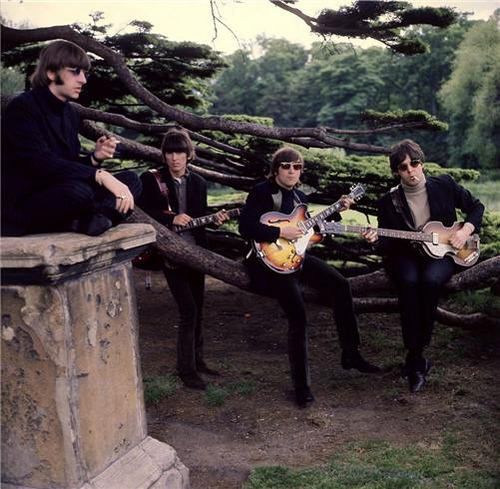 Being a B-Side, “Rain” wasn’t played as much as “Paperback Writer,” a #1, and only got as high as 23 on the US charts. It’s a shame, because its just as good and more revolutionary then “Paperback Writer.” “Rain” features one of Paul’s most intricate bass lines, Ringo’s first real psychedelic drumming, and just stunningly gorgeous harmonies from John, Paul, and George. Also, its the first pop song ever to have backwards vocals, tacked on the end. It’s the song that paved the way for the glorious psychedelic pop that was to come on Revolver, remarkable in that the Beatles were so good they didn’t need to include their masterpiece singles to pad out their albums, utterly unprecedented in music history. So, for everyone who hasn’t sapped in the luxurious beauty that is “Rain,” enjoy. PS- This was also one of the first music videos ever…so put that in your pipes and smoke it too! Powered by WordPress v 5.0. Page in 0.991 seconds.